One easy way to get a design on top of a cake or cupcakes is to use a stencil. The stencil typically involves some sort of cutout design that is placed over the top of the cupcake, then cocoa powder or confectioners’ sugar is sifted over the pattern. When the stencil is removed, all you have left is a sharp design on top of your cake. I often make my own stencils using thick paper, which is easy to do and allows you to make your own patterns. The drawback to this is that even thick paper can bend when you’re working with it, leaving you with unwanted piles of sugar (or other materials) as you try to sift on your design. Paper stencils also do not store well, and it can be difficult to do more than basic designs when you have to cut them out yourself. Stencils seem to be becoming more widely available, and stiffer stencils made of plastic, metal and other materials are becoming easier to find. 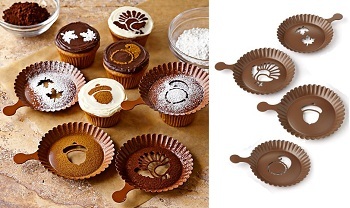 This Autumn Cupcake Stencil Set from Williams Sonoma is a good example. The stencils are made of sturdy nylon and feature fall-themed designs that are detailed – but still simple enough that they make for a clean, easy-to-read transfer. 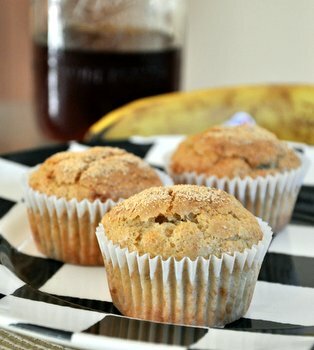 Unlike a paper design, these have a built-in curve to them that allows them to conform to the shape of your cupcake (frosted or unfrosted) and that also helps to ensure that you get a sharp image in the end. These stencils are reusable, too, so they can be used throughout the fall baking season.